The New York shows aren't satisfying me, and it’s Monday (at the time of writing). I’ve seen approximately five collections that I can say I really liked. A curse has been looming over the designers this season. They’ve all come off a fantastic Fall season to a much weaker collection by comparison. A label that I usually don’t pay much attention to is Edun. You’ve probably heard of it. Ali Hewson and her husband, U2 frontman, Bono founded the label in 2005 to promote trade in Africa. Sustainability is a word that’s been thrown about for a while now. Stella McCartney, Vivienne Westwood and even conglomerate LVMH (who own Edun) are pushing it to the fore. 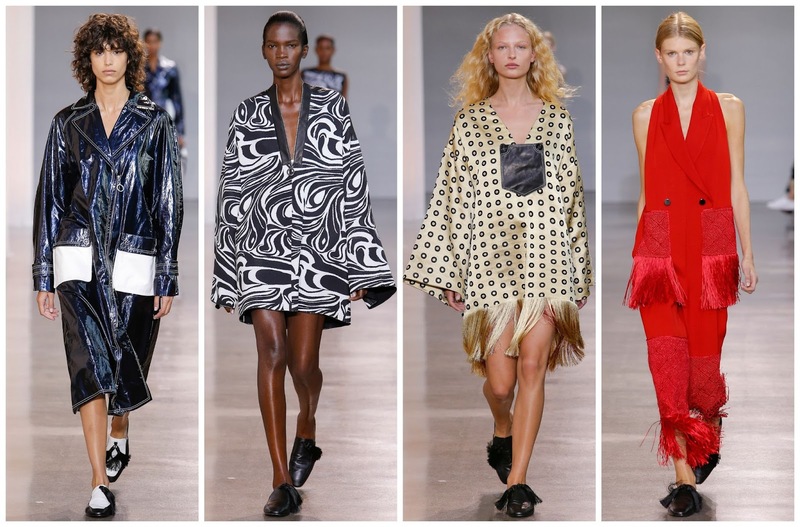 Edun was set up in 2005 to establish a fair-trade link with Africa. 85% of the collection is produced in Africa. The brand has sourced its product from Tunisia, Tanzania, Kenya Madagascar, Morocco and Uganda. Africa is important to the founders, who are attempting to fix some of the issues there. Creative director Danielle Sherman is further connecting the brand to Africa with her inspiration: Kuba Kingdom. Located in the Democratic Republic of Congo, the people and their dress inspired Sherman. Google Images was my source of images of the Kuba Kingdom. You’ll stumble upon fringe, embroidered raffia cloth, various forms of headdress, patterned beautifully. Red, gold, navy and black are recurring colours. Those colours carried through to the collection. Mica Arganaraz opened the show in a shiny navy coat, with subtle piping and white pockets. Irina Liss’ sculptured white gown with a keyhole split and three buttons was a stunning number. One of the strongest looks was a mini dress, look 7. An off the shoulder pleated mini with white piping and white button details. A similar orange top with white buttons was also stunning, especially against contrasting black and white trousers, also baring frayed hems. Aamito Lagum was a tribal goddess in her black and white printed limo dress with faux leather lapels. Capturing the spirit of the African inspiration, the dress was one of the most memorable pieces from the collection. If there’s an advertising campaign, this dress and Aamito need to be in it. The same goes for Amlina Estevão who rocked her black and white tribal print dress with fringe details and raffia embroidery. A gold tunic dress with black polka dots had a fringed hem was a number that benefitted from a fast-paced catwalk show. A black pleated mini dress with fringed shoulders and waist, also saw the fringe bounce as the model strutted down the runway. More fringe and embroidery took to the runway, and, unfortunately, the show drew to a close. Sometimes it’s the designers you expect the least from, deliver the most impactful of shows. I’m delighted to see such a sublime show from Danielle Sherman. If you need something timeless, effortless and stylish, Edun has you covered.